In 1888, a series of unsolved homicides in London's Whitechapel district were attributed to a serial killer who would soon be referred to as "Jack the Ripper." 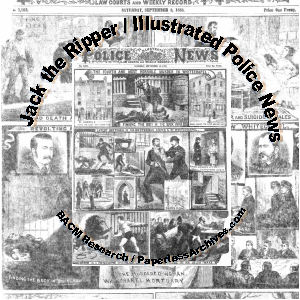 The Metropolitan Police identify five women as victims of the same murderer: Mary Ann Nichols, Annie Chapman, Elizabeth Stride, Catherine Eddowes and Mary Jane Kelly, all killed between Aug. 31 and Dec. 20, 1888. 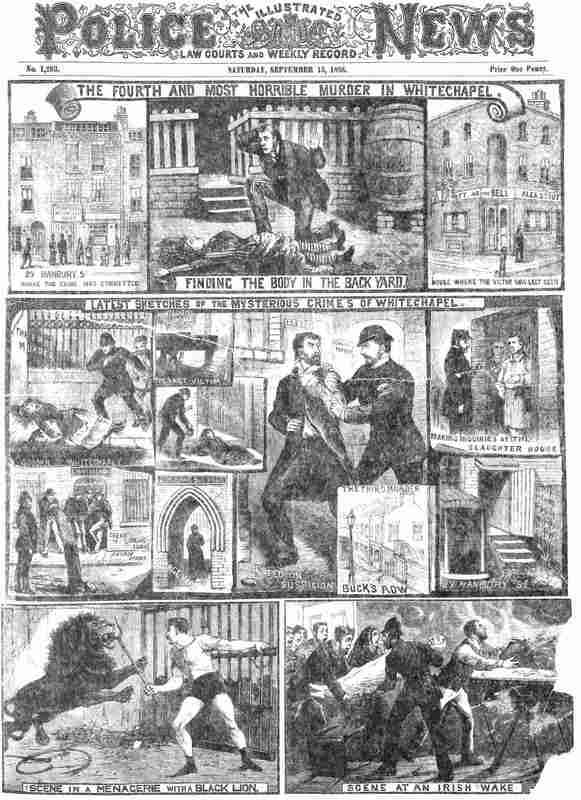 These issues of the Illustrated Police News chronicle the foundation of known facts and myths, which are basis of the history and pseudo-history of "Jack the Ripper." In print from 1864 to 1938, the weekly Illustrated Police News was one of the first British "tabloids." It featured sensational illustrations and melodramatic articles on crime and punishment in England. It also published stories of shocking crimes from outside the country. 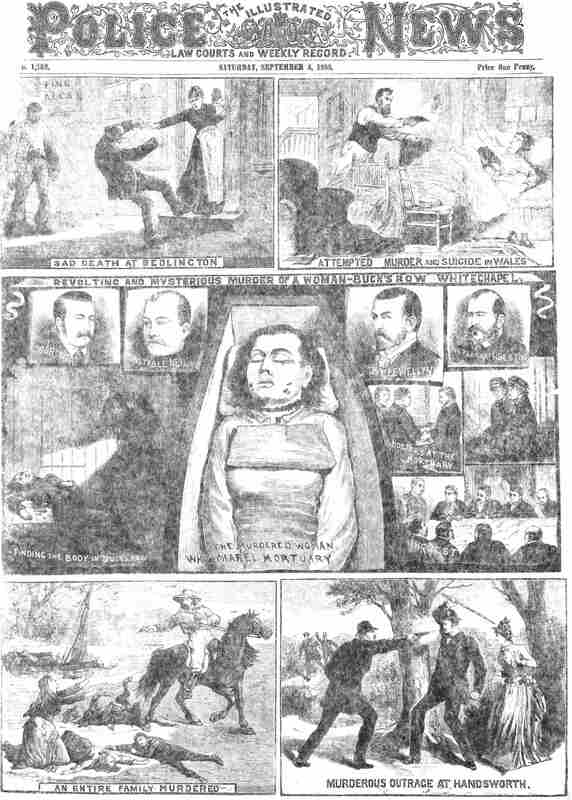 The front page of every issue was made up of panels of drawings of dramatic crime scenes and despicable criminals related to the articles covered in the rest of its pages. It also covered tragic deaths by accident and misfortune, executions, domestic violence, duels, attacks by animals on humans, acts of cruelty to animals, prison escapes, and boxing matches. The newspaper was an offshoot of 18th and 19th century broadsheets, known as "Bloody Murders," that were published in England, and often distributed at the site of public executions. The newspaper's reliance on illustrations was patterned after the highly successful Illustrated London News, founded in 1842. The Police News' lurid coverage of tragedy and horror, even before its famous coverage of the Whitechapel Murders, in 1886 lead readers of the Pall Mall Gazette to vote the Police News the "worst English newspaper." Linda Strattman, author of "Cruel Deeds and Dreadful Calamities" (2011), describes the images in IPN as having, "an immediacy, a power and the ability to create an emotional link with the reader shared with few." This collection contains 59 complete issues published between April 7, 1888 and May 25, 1889, and 24 complete issues published between July 6, 1889 and January 28, 1899. A Whitechapel murder of a woman slashed first appears on the cover of the August 18, 1888 issue. There were at least 12 murders of prostitutes in the Whitechapel area of London from 1888 to 1891, known as the Whitechapel Murders. Five of these are commonly identified as the Jack the Ripper murders, the canonical five. The victims: Mary Ann Nichols at Buck's Row, Whitechapel, on Friday 31 August 1888; Annie Chapman at Rear Yard at 29 Hanbury Street, Spitalfields on Saturday 8 September 1888; Elizabeth Stride at the yard at side of 40 Berner Street, St Georges-in-the-East on Sunday 30 September 1888; Catherine Eddowes at Mitre Square, Aldgate, City of London on Sunday 30 September 1888; Mary Jane Kelly at 13 Miller's Court, 26 Dorset Street Spitalfields on Friday 9 November 1888. Included in this collection is every issue of Illustrated Police News published from April 21, 1888 to May 25, 1889.